Racing legend Russell Coutts, winner of the last three America's Cups, will be taking part in a match race at the Biograd Boat and Charter Show on the weekend of October 21st to 22nd against a Croatian team. Cro-a-sail, a Croatian racing association that aims to give top Croatian sailors the opportunity to compete amongst the best in the world, is amongst just a handful of organisations that have so far taken delivery of the RC 44. 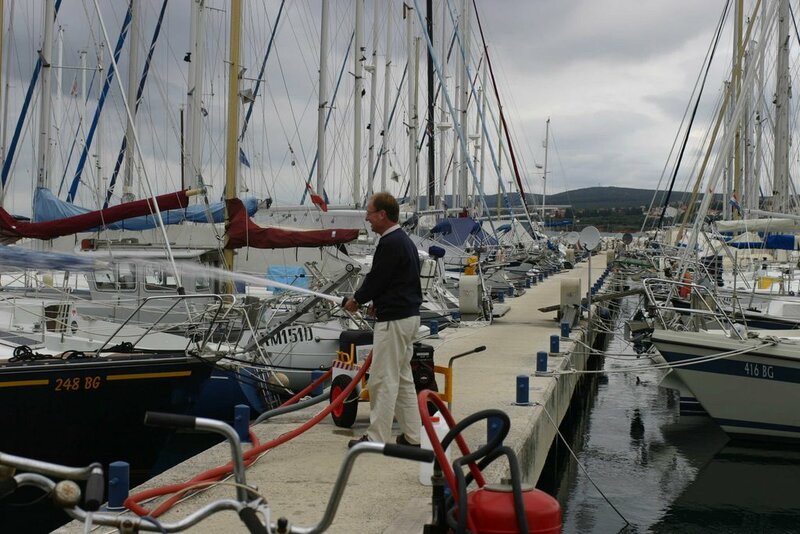 They’ll be pitting their wits against Russell’s team at the Biograd match race. 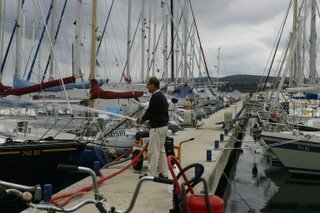 For more information on the Biograd race and Boat show go to Marina Kornati, to read more about the yacht and races go to RC 44, and to find out more about the Croatian challengers, go to Cro-a-sail. 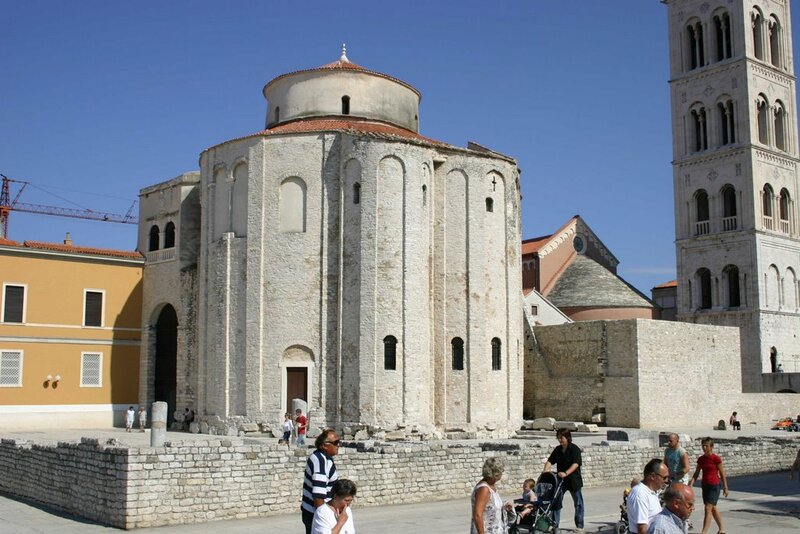 Croatia Online Air Travel News - The Zadar Region Opens Up? We have it on reasonably good authority that Ryanair will soon be announcing flights to Zadar. The attention given to Split Airport, by British Airways and the low cost airlines, has created a huge surge of interest in the Split Area. 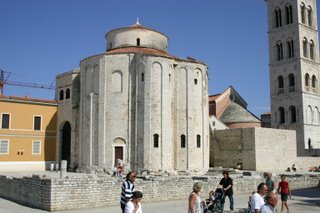 Even though Zadar is only a two hour drive away from Split, the Zadar region has suffered as a result. The availability of cheap flights and the proximity of airports are big factors in second home purchases and also, for example, in deciding where to pick up a charter boat, so this news can only be good for tourism and related activities around Zadar. Zadar itself has a lot to offer and the islands around it – Ugljan, Pašman, Dugi Otok and the Kornati islands - are much more “Croatia as it once was” than, for example, Brać and Hvar. Pending the announcement of the schedules, if you have some spare time, take the coast road from Split up to Zadar, via Rogoznica, Primošten, Šibenik and Biograd and find out what you’ve been missing! Readers of our last posting will be aware that our blogger hosts were having some troubles with picture loading. 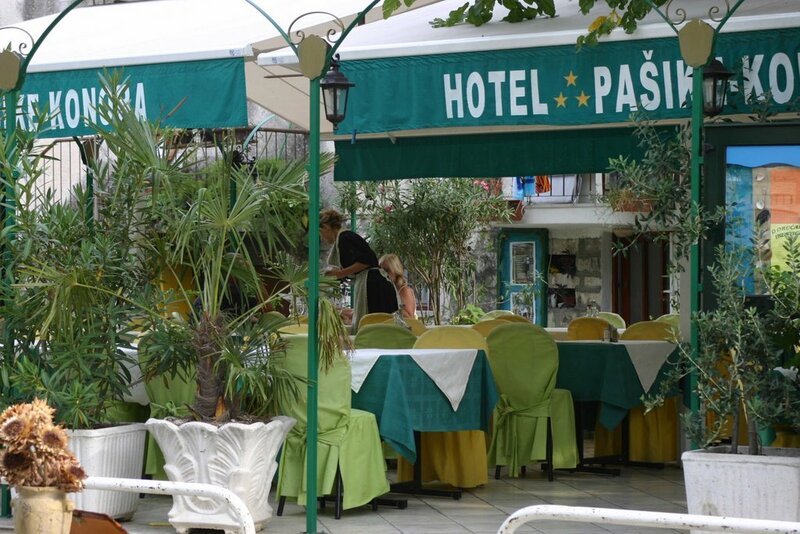 The problem seems to have been solved so here are a couple of pictures to go with the previous posting - Hotel Pasike and the new language school in Trogir. See below for more information. 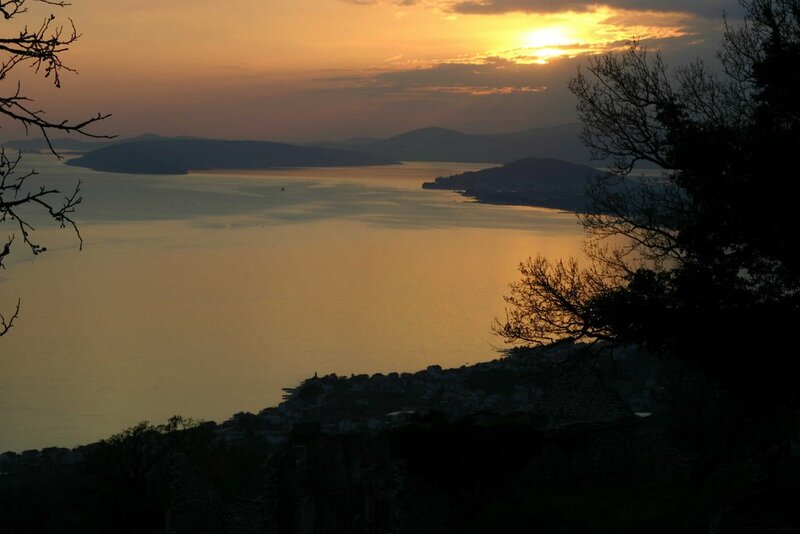 A new language school has opened up in Trogir, co-owned by the very dedicated and patient Ivana Rogulj, who has been assisting Croatia Online’s editor in the art of learning Croatian. 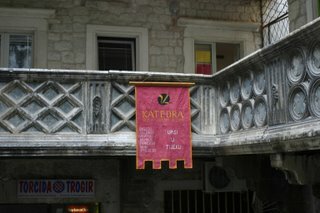 It’s called Katedra and located in a classic building on the south west corner of the Cathedral Square in Trogir. Apart from teaching Croatian, the school offers courses in English, Italian, German, French, Russian and Spanish. 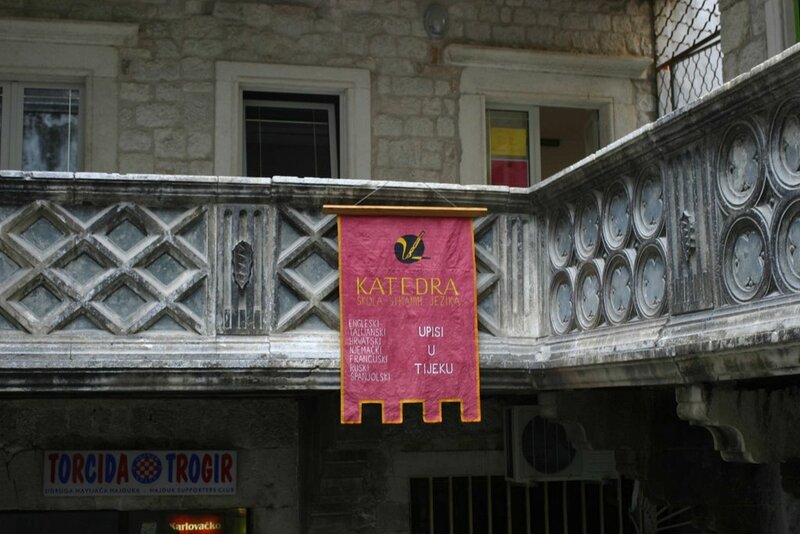 Katedra, Gradska 35, Trogir, is well signed from the square so check it out if you are in the area and in need a new challenge for the autumn. More details soon. 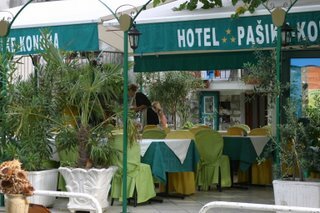 Just by the new pedestrian bridge, on the mainland sign of town, Hotel Pašike and the restaurant of the same name deserve full marks for trying to offer something new. The restaurant has been around for a while but had a facelift in 2004 when the owners decided to convert their old townhouse into a family hotel. The hotel bedrooms are tastefully furnished with antiques but offer all mod cons. Prices vary from 800 kunas for a double room to 1200 kunas for the apartment based on 2 people sharing in the high season. The restaurant has a large and colourful terrace with tables and chairs draped in gold, green, brown and yellow covers. Waitresses are dressed in traditional costume, we listened to a great guitar and mandolin duo, and the varied menu has a number of traditional local dishes. It was packed when we visited on Saturday night and that’s probably not the best day of the week to try out a new place – the two very friendly waitresses seemed a little overstretched, the food was ok rather than great, and it’s a little pricier than many of its neighbours. However the customers seemed to be enjoying themselves and there was a constant stream of new arrivals for the hotel. 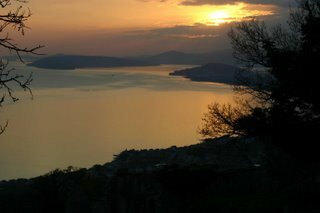 Go to www.hotelpasike.com for more information. It seems that the Croatian Government is looking to regulate real estate agencies quite severely in the coming months. A one month course and exams will be amongst the requirements necessary to gain a licence. The details are still being ironed out so we’ll be updating you on this once we have more information. Hopefully the weather where you are is better than the weather in the Split area for the last few days - thunder, lightening, strong south winds and heavy rain. Looks like there is more to come but we're not complaining too much as, just before, we had over a week of almost perfect summer weather and a lovely warm Adriatic to swim in. The main tourist season seems to have ended as dramatically as it started. One day the beaches are packed and the next day virtually empty. It will be interesting to see if there are enough seasonal bars and restaurants open to cater for the continuing high quantity of international flights. The stormy August weather and airport security problems can’t have helped the tourist industry statistics, and anecdotal evidence suggests that those in the front line may be disappointed with the success of this year’s season so far. However it’s difficult to judge whether that’s because expectations were much higher this year, the takings were really down, or Croatians in the tourist industry share a similar pessimistic disposition to farmers! The statistics will provide some harder evidence in due course but, with some tourism still operating under grey market conditions, statistical evidence can only be partially conclusive. We’re in the process of trying to gather a range of facts and figures, as well as more anecdotal feedback, and will report back when we can draw some meaningful conclusions. In the meantime we'd be delighted to hear feedback from readers.